Carroll Industrial Molds announced today that we have acquired, and placed in service, a Haas VF6-SS Vertical CNC machining center. 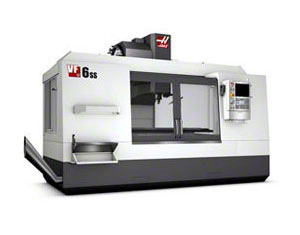 The VF-6SS is a “Super Speed” machining center with a 30-hp, 40 taper, 12,000 rpm in-line vector drive spindle. The machine capacites are 50” X-axis, 26” Y-axis, and 25” Z-axis. The machine is also equipped with a 40 station side mounted tool changer and high pressure through-spindle coolant. With it’s high capacity metal removal rates we plan on using this machine for producing billet cavities and high production projects.